My background lies in aquaculture and in population and statistical modelling. I am interested in population genetics, conservation, molecular ecology, and environmental statistics, primarily for aquatic organisms and ecosystems. I hope to contribute to the promotion of sustainable aquaculture by exploring aquaculture-environmental interactions. In the summer of 2013 I took part in fieldwork for the Norwegian Institute for Nature Research (NINA) as part of my MRes (St Andrews University) which involved counting sea lice (Lepeoptherius salmonis) on wild sea trout (Salmo trutta trutta) in the Romsdalfjord system in southern Norway. This data contributed towards a report on the interactions of sea lice from farmed and wild salmonids in the area. The main goal of the Aquatrace project is to develop molecular tools to assess and monitor the genetic impact of aquaculture species on wild stocks, and to explore the basic links between genetic differences among farmed and wild fish. Wild fish populations are known to exhibit highly structured genetic populations and may be ‘locally adapted’ to their native environment. Atlantic salmon are a prime example of this due to their natural instincts to home to, and breed in, their natal rivers. 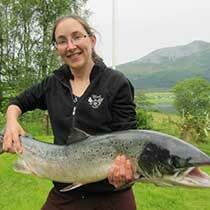 Farmed Atlantic salmon can also be viewed as ‘locally adapted’ to the farming environment, and may contain a very different set of ‘hatchery genes’ which have been selected for over a number of generations during the domestication process. Local adaptation and genetic variation are important for the survival and reproductive success of wild populations, as is the ability to adapt to a changing environment. There is thus a concern over escaped farmed salmon introgressing their maladaptive genes into wild, locally adapted populations. This introgression could lead to a decrease in the viability of the wild population, due to the hybrid offspring being less equipped to deal with the local environment as pure wild offspring. My specific role in this project is to investigate and understand the genetic differences between wild, farmed and hybrid conspecifics of a model genetic species, Salmo salar L. This will be done by quantifying the phenotypic reaction norms of key life history traits (including growth, reproduction and survival) of the fish under a range of environmental parameters. This will shed light on how the genetic introgression of ‘hatchery genes’ affects the fitness of wild populations. Experiments will be conducted in a common garden setting at the IMR research station, Matre, in southern Norway. We will be investigating the effect of varied temperature, density, and feeding regimes on the growth reaction norms of each strain (wild, farmed, and hybrid salmon).